Post the direct link to your project. It must be a new project, please no old projects and no links just to your blog. Please try to include a Cricut cut or another die cut using your cutter. Your post MUST include a link back to CookingWithCricut.com to be eligible. Let’s see what the Design Team dreamed up for your inspiration! 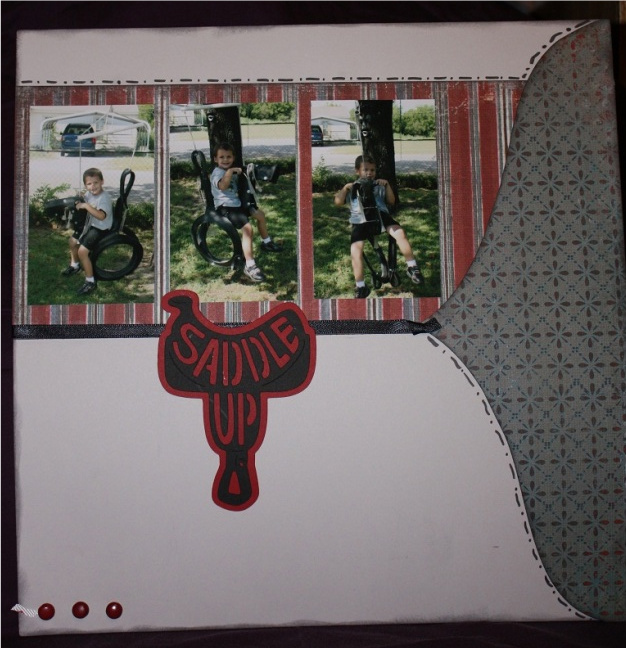 "Saddle Up" and head over to Melissa's Blog for more details on this super layout! Please go to Gaby's Blog for more details on this darling layout! Be sure to head over and visit Becky’s blog for details on this sweet card! Oh how precious! Be sure to hop on over to Jean’s Blog for details on this precious school days layout! “Float” on over to Jen’s blog for some sunshine from our resident sunshine girl and get details on this super cute card! “Swing” by Dalis’s Blog for details on this COOL curved shadow card! Be sure to head over to Madison’s Blog and get details on this beautiful Shadow Box project! 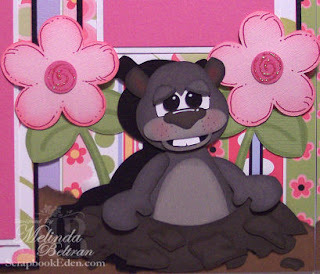 Be sure to visit Anita’s blog and get details on this adorable slider card! Visit Ronnie’s Blog for more details on this “Sweet” layout! Isn’t that baby an angel! I made this with a new cutting file set that I will be releasing very soon. It features these adorable little Ground Hogs, flowers and title. Here is a close up of one of the little ground hogs. Thank you so much for playing along with us! The CookingWithCricut.com Design Team! Great projects, ladies!! Melin, those little groundhogs are adorable. You have outdone yourself again, girlie! Great projects ladies, all very nice!!! Happy ground hogs day to you all!! Everybody has such great projects! what a seriously talented team of girls we have wow!!!! Now about that ground hog... OMG... I think this has to be one of the cutest if not the cutest cut you have ever done! What great projects the DT created!!!!! All of them!!! and I am with Dalis, this is just the cutest ground hog I have seen-- Adorable!!! love the big teeth!!! Melin your double LO is ADORABLE as always ! Super cute. What a great lo. The ground hog is to cute. Thanks for sharing all your creativity with us. very nice projects, i love the ground hog is super cute. I get inspire looking at all those creative projects thanks! Love these challenges! Thank you so much for the fun! More wonderful projects from the DT...thanks for sharing! I just linked up my entry for the challenge...had fun with it! These are all great projects. I'm inspired to create additional cards to stock up for when they are needed. TFS! I loved the DT projects - thanks for this challenge!